create a culture where everyone feels able to express their opinions. We asked our Big Local ambassadors to help explain what the roles look like in practice. A strategic thinker keeps an eye on the bigger picture and makes sure that activities relate to the outcomes the group wants to see. A connector brings together different people and groups across the area. A do-er makes things happen. Many people are do-ers, from those who do micro-volunteering to those in full time employment working on Big Local. An increasing number of areas are hiring a worker from within the area to act as a do-er and increase capacity to deliver Big Local. A catalyst sparks new ideas and ways of doing things. An advisor provides expert advice and support. Advisors may be legal or finance professionals. The role of reps, locally trusted organisations and other partners in providing expert advice is often important as areas deliver their projects. Having good advisors was really important to Westfield Big Local: view the case study. A coach supports development and motivates others. This is often someone who is slightly removed, but residents can also act as a coach to motivate and develop each other. Partnerships can become weaker when they lack people who can do each role. So how can you make sure your partnership stays strong? One person may perform more than one role and may also change roles over the course of time. You might also need an extra skill just for a particular project and thinking flexibly about the roles can be the key to success. The key message from the research is that everyone on the partnership has a role to play in Big Local. Choosing the right people to work with and connecting to others in the community to support delivery can make all the difference. To succeed, support is needed from other residents, reps, locally trusted organisations, workers, local organisations, other Big Local areas and Local Trust to help deliver Big Local. Search our library of advice and guidance on delivering Big Local. 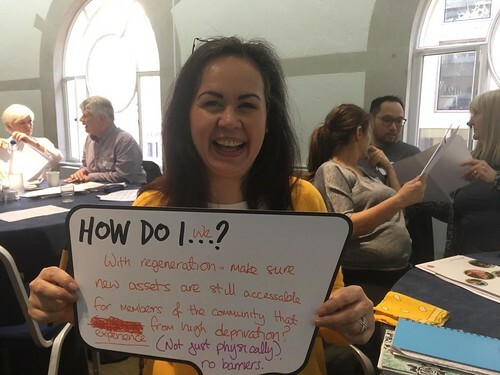 Attend a training event to build your skills and connect you with other Big Local areas. Download a summary about the shared leadership roles. Read the full research report from CDF.